A rubber door stop on the floor could have been a solution, but this would have been a potential trip hazard. So, in order to avoid this happening again, Lotinga sourced a specific heavy duty closure; as a result their new personnel doors have remained damage free. There are a variety of solutions to help avoid wind or other forms of damage. Check out our Door Safety Systems Page for more information. 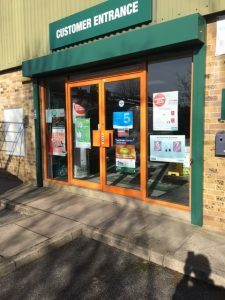 Click on our latest Project page to see the transformation of this entrance area and the solution to prevent further door damage. If you would like advice on this issue or a quotation for the preventative measures mentioned in this Article or, other advice on Maintenance of your industrial doors?